After an 11 hour flight, we arrived back in Paris. We took this as an opportunity to explore more of Paris, this time with my brother and sister-in-law joining us from London (I still think the Channel Tunnel is a rather cool invention). Despite the somewhat drizzly weather, we decided to do a walk around Montmartre, enjoying this fairly hilly part of the city, included a tour of Sacre Coeur (my first since Junior High) and looking over the city from the terrace. 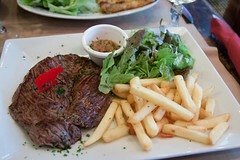 But it was also time for lunch, and we settled on a fairly nice café near the metro station, Café Le Saint-Jean, where I had another chance to indulge in one of my simple pleasures: a basic steak frites. Like uncountably many cafés around Paris, this one has the basic Parisien Café look pretty much nailed: tiny round tables, wooden chairs, black-and-while tile, and robed waiters dashing about with trays of food, coffee, wine, and beer. We quickly found ourselves seated by the window, and after a short perusal of the menu, I decided that their bavette avec frites was the way to go. As I mentioned in my review of Le Bistrot d’Henri, the French have their own way with steaks, from the butchering (the cuts are different, and often cut along the grain instead of against it), to the cooking (the French abhor overcooking meat, so the scale runs extremely rare). And done well, the results are awesome, such as this bavette. A relatively cheap and not-so-tend cut of meat (the American name for this is the distinctly less attractive flap steak, which, like skirt, hanger, and flank, used to have a tendency to get used in fajitas and as chopped meat in dishes before more recent food trends), this bavette was well-butchered and tended , and cooked a perfect rare (barely warm on the inside, just seared and crisped on the outside). For a relatively cheap steak, this was flavorable, tender, and delicious. Add in some near-perfect frites and a small crock of intense Dijon mustard, and this was a very pleasant little lunch. 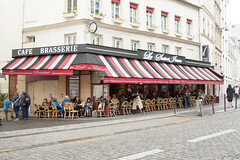 Overall, Café Le Saint-Jean was the perfect little lunch stop, a rather good representation of the classic French “bistro”, with good food, pleasant environs, and efficient service. While there are many other cafés like Café Le Saint-Jean, this one was good enough to warrant a return trip if I’m in the area.